Good Day Love! Valentine’s Day is just a few short days away, so I am wrapping up my Valentine cards. Speaking of ‘wrapping it up’ today’s card includes a yummy little treat held with a hug. 🙂 I was inspired by Laura from Doublestick Heaven Blog, she is incredible. I used the Woodland Friends images that you can find here at Sunsational Stamps. I fussy cut out the log and the raccoon. I cut two raccoons and colored the back of the second one then attached them together, that way when I folded the hands inward (to hold the Hershey Nugget) it would be finished on both sides. I popped up the leaves on the log and the feet of the raccoon. I attached the candy with Scor Tape and folded in his paws. The background was sponged with Distress Inks in the following colors; Faded Jeans, Tumbled Glass, Peacock Feathers, Evergreen Bough and Peeled Paint. I began with the Peacock Feathers which is the center color and built and blended outward. The sentiments were from the Close To My Heart January Stamp Of The Month set Beautiful Bouquet. I hope you enjoyed today’s card, and as always we would love it if you would follow our blog by clicking on the “Follow Us” button and Like us on Facebook so you don’t miss a thing! Howdy-do rainbow chasers! 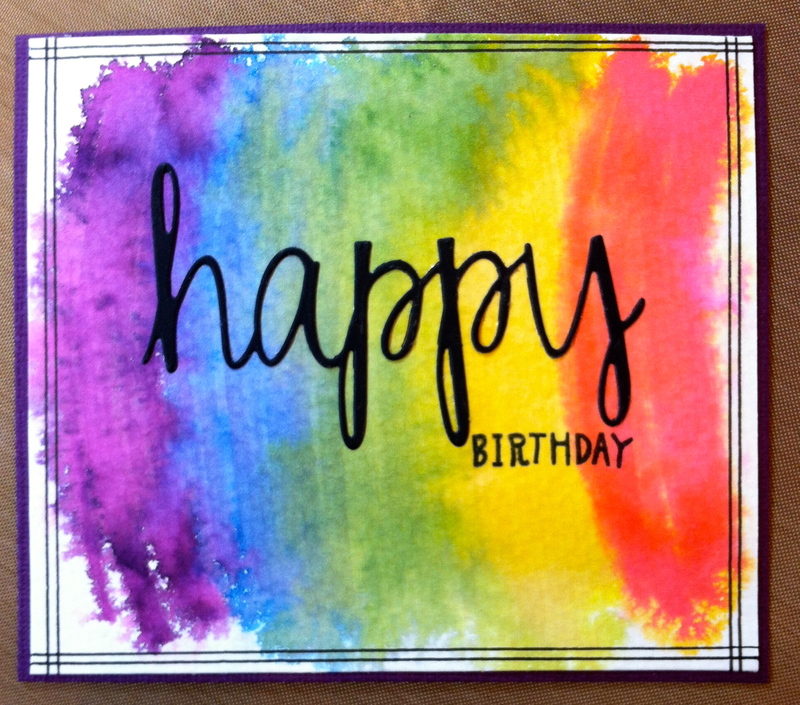 Today I have a birthday card that was inspired by a rainbow challenge. This was super simple and super fun! I used watercolor paper, Distress Markers in Seedless Preserves, Faded Jeans, Mowed Lawn, Mustard Seed, and Ripe Persimmon. I simply scribbled the brush side in a slight arch, overlapping ever so slightly….then squirted the daylights out of it with water. 🙂 Once it dried I drew double lines along the edges. 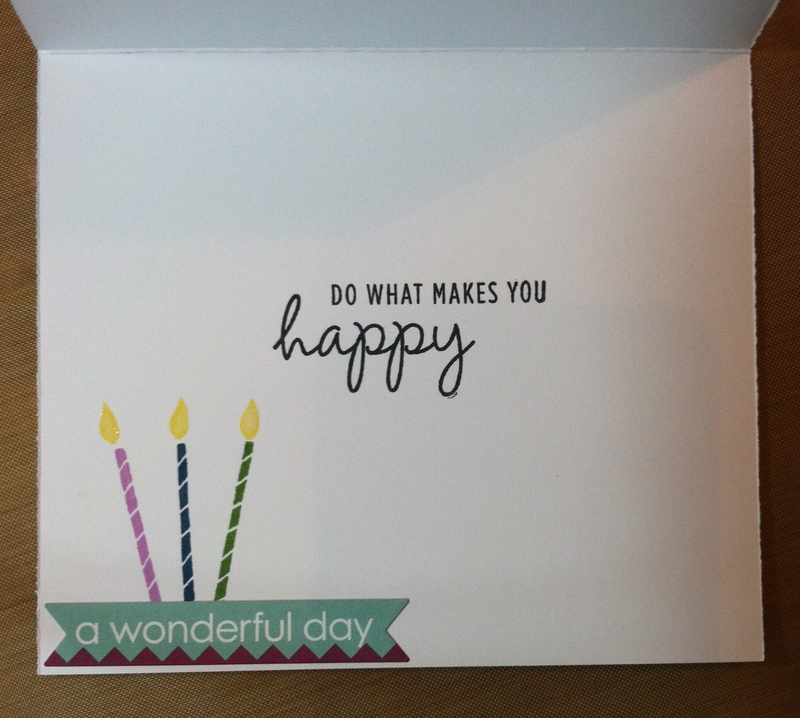 I used the Simon Says Stamp “Happy” die cut and ran it through my eBosser using Doodlebug Beetle Black cardstock. The word Birthday is stamped from a set I received in a Studio Calico kit. I mounted the watercolor paper on Doodlebug Orchid cardstock. The inside I used a sentiment from Close To My Heart’s Wavy Bloom, and finished it off using candles from the Studio Calico kit mentioned above, and stamping them each in one of three of the colors on the front of the card, then added a Bella Blvd sticker. I really made good use of my miscellaneous stash this week! Thanks for stopping by on your way to the end of the rainbow! Please be sure to click on the left to follow our blog and Like us on Facebook, so you don’t miss a thing!